Another huge pile of great Sunday strips from the ASIFA Hollywood Animation Archive courtesy of the Marc Deckter Challenge (which is over now)… lots more Gross and Messmer. Check them out here and here. 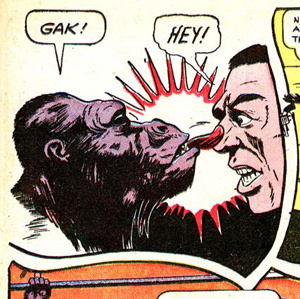 In their ongoing scans of the Nedor comics line, Nedor-a-Day brings us The Black Terror versus a gorilla… click the above image to go there. Irving’s Spectres Friday Comic Book Day. Sir Bagby: A Strip for Fans of Knighthood? Timeless credit Thursday story day. The Black Terror: You’ll Die Laughing! Obscurity of the Day: Sherlock Holmes, Jr.
Let’s Make Fun of TV Shows! 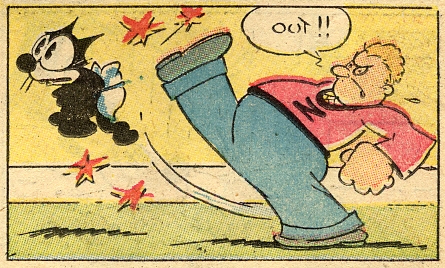 Here’s a fun Otto Messmer Felix the Cat cartoon. Today Comicrazy’s brings us some beautiful huge scans of one of the great Otto Messmer’s header strips for the Felix the Cat comic strip… Laura. Click the image to go to the comics. Rhoda Trail: Gold Dust Dynamite! 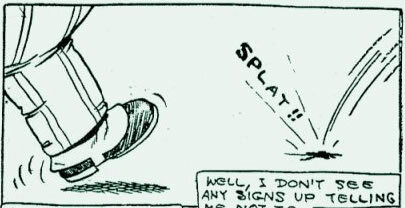 from “Krazy Kat” #4, 1952: soup’s on! Happy (belated) Birthday, Alley Oop! New Strip! Madge the Magician’s Daughter! Another unbelievably great selection of new old comics on the web. 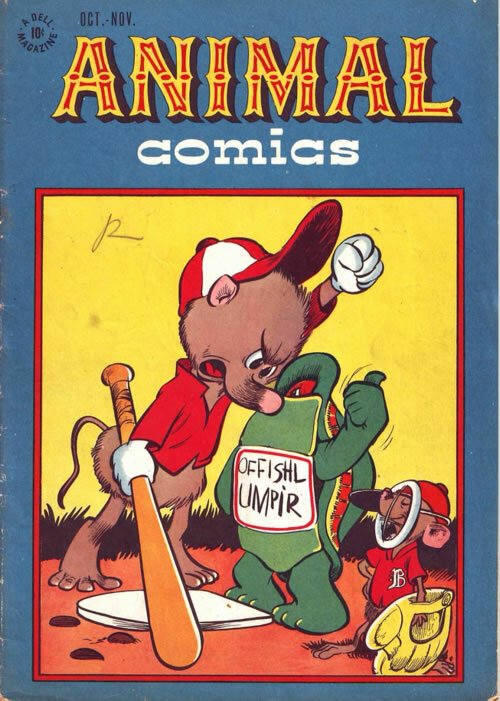 As has been the case recently, it is hard to pick one to feature… Jack Cole, Frank Frazetta funny animals, comics by Tad, a whole Milt Gross book (!!!) and much more great stuff can be found below. 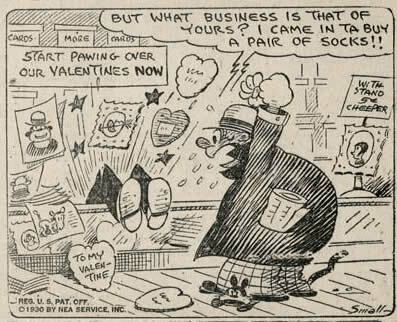 I’ve chosen to feature Otto Messmer’s Felix the Cat. 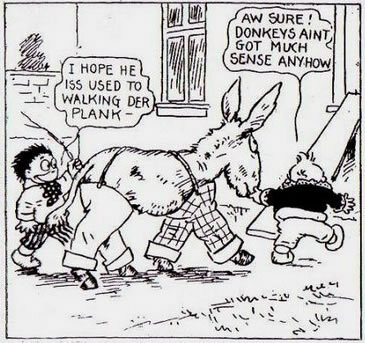 Messmer is another one of the greats of childrens’ comics. He has a beautifully simple style, and I love the way his stories unwind. Although widely acclaimed, Messmer still seems pretty underrated to me, and is really in need of more reprinting (Fantagraphics did do a great reprint of some of his newspaper strips a while ago called Nine Lives to Live: A Classic Felix Celebration ). I think his Felix comics could sell like crazy if some good publisher packaged them well and marketed them to children. Click on the image below to read a Felix comic at Comicrazys. Jack Cole Week Wednesday Advertising Day. New Strip! Indoor (and Outdoor) Sports! Jack Cole Week Tuesday strip day. A Pound of Flessel Sunday Leftover Day. Jack Cole Week. Monday cartoon day. Free Golden Age comic book online reprints. One Walker Special Friday comic day. A panoramic view of Pinhead-ville! I’ve decided to start slowly making my way through the Otto Messmer’s Felix the Cat cartoons that have been posted online that I can find in the order they were released. Here is Felix’s first cartoon, Feline Follies, from 1919. 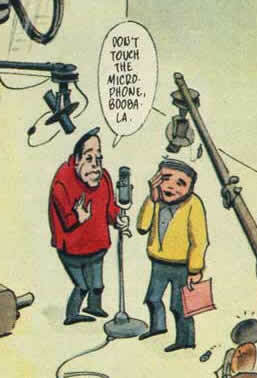 Technically, it isn’t even a Felix cartoon… he is referred to as “Master Tom” in this one. I don’t know if Messmer had much experience animating before this, but it sure looks like he must have. His proficiency for showing character in his characters is already apparent… look at “Master Tom’s” vanity as he checks himself out in the mirror. 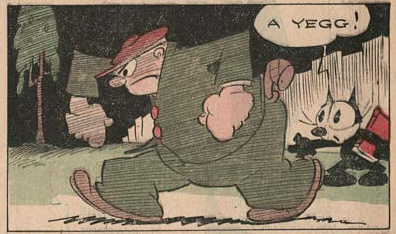 It is often noted that Felix was the first cartoon character with a well-defined personality. His personality is definitely what made him the most popular animated cartoon character of the twenties. 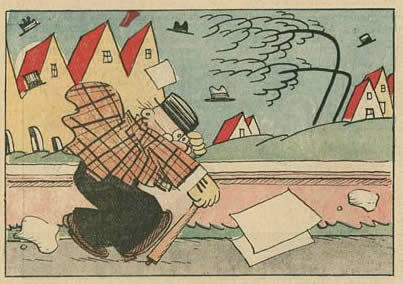 Besides the wonderful Felix animated cartoons, Messmer was a fantastic comic strip and comic book cartoonist. The ASIFA Animation Archive recently had a generous post of Felix Sunday newspaper comics which can be seen here. If you dig these comics, you won’t want to miss the excellent reprint book that came out from Fantagraphics a number of years ago, Nine Lives to Live. I wish someone would do a huge reprint series of Messmer’s comic book work like the great Little Lulu books from Dark Horse… I can’t think of a better comic book to read to my almost 2-year-old daughter.